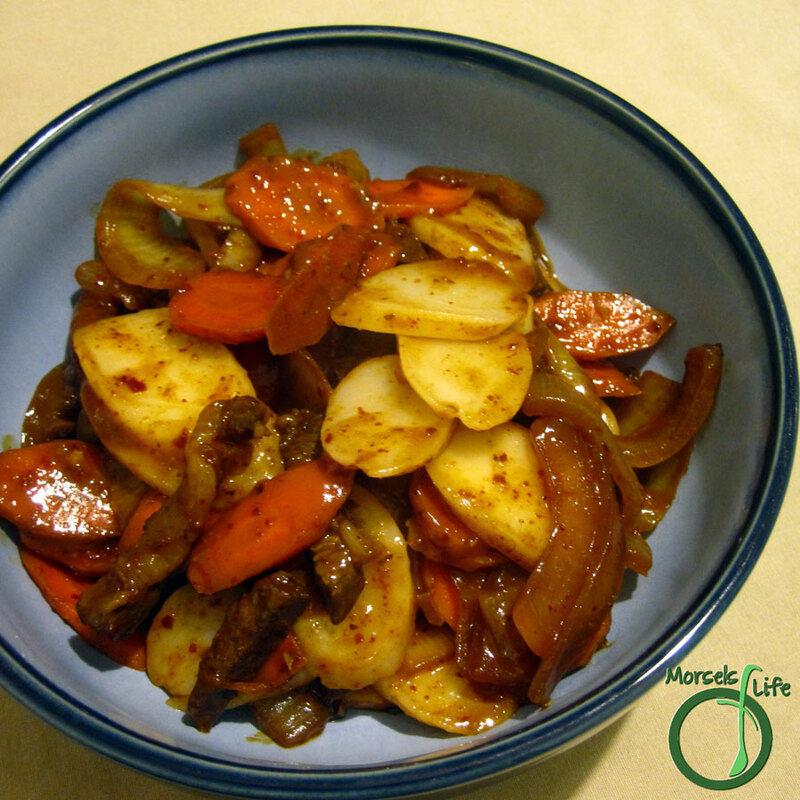 A fiery yet sweet and peppery Korean beef and rice cake street dish that eats like a meal. Being married to a Korean, you'd think I often make Korean dishes, but I usually don't. While I grew up eating Chinese cuisine, James grew up eating rural, Jeolla-do Korean cuisine, but he's never been picky. So long as it's food, he thinks it delicious. If fact, he tends to scarf down anything in front of him, and I suspect he lacks any palate. We buy a lot of Asian groceries at a large Korean supermarket and recently received a complimentary package of rice cakes for a large purchase. It's worth noting these Asian rice cakes are not the same as the American kind. Most folks in America think of the puffed rice wafers that come in a zillion flavors, but Asian rice cakes are a heavier, glutinous rice cake with a consistency slightly denser than taffy. The Chinese call it nian gao, the Japanese mochi, and the Korean dduk. At James' request, I decided to use the dduk to make dduk bok-ki, a famous street food originating from the royal Korean court. As you can imagine, cooking it is fast, and the dish is wonderful and very filling! What's one of your favorite Korean dishes? 7 ounces rice cakes (dduk/nian gao) I used the flat ones, although traditionally dduk bok ki is made with fingerlike rice cakes. 1 tablespoon red pepper flakes I used gochugaru. 1 tablespoon red pepper paste I used gochujang. (optional) Soak rice cakes/dduk/nian gao overnight in water. Although optional, it'll decrease your cooking time. Boil dduk until soft, about 5 minutes or so. Combine remaining materials and stir fry until desired level of tendernesss reached. Add cooked dduk and mix in until well coated.